Hyundai Veloster | What Car? The Hyundai Veloster has finally been unveiled complete with the Veloster name, which the American division of Hyundai was reportedly lobbying to have changed right up until the eve of the Detroit show. Hyundai will re-enter the affordable coup market with this car, which is especially notable for the unusual layout of a single door on the drivers side and two conventional doors on the passenger side. Hyundai says this format is the same on both left and right-hand-drive models. When it arrives in the UK, the Veloster will be 'priced between the Renault Mgane Coup and VW Scirocco', according to Hyundai sources. Hyundai insiders describe the car as mixing 'the style of a coup and the practicality of a hatch; we call it a utility coup'. The styling of the final production version, which is undergoing final testing at Hyundais Namyang development centre, is close to the 2007 Veloster concept. However, it now wears Hyundais new corporate nose, conventional rear lights and a hatchback. The interior has been completely rethought, though. It uses a new centre console design which combines the climate control and touch screen and is seen in this image that will make its debut in Hyundais i40. Taking cues from the Audi TT, the styling of the Veloster cabin is particularly impressive and benefits from notably high-quality materials. 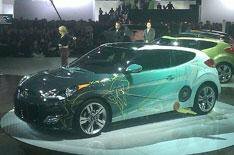 Initially, the Veloster will be available with two different 1.6-litre engines. The more powerful unit generates 138bhp and 123lb ft of torque and comes hooked up to a six-speed manual gearbox. The less powerful engine has 130bhp and 117lb ft of torque. It is connected to Hyundais first dual-clutch transmission. Company engineers expect 5-6% better economy than would be achieved with a manual box. The Veloster, which goes on sale later this year, will be offered with a range of upmarket options, including a premium sound system, keyless push-button starting, LED lighting and a panoramic sunroof.